Ever attentive and predictive to the needs of our community of clients, Livegenic offers customers flexibility and unlimited customization in report templates. 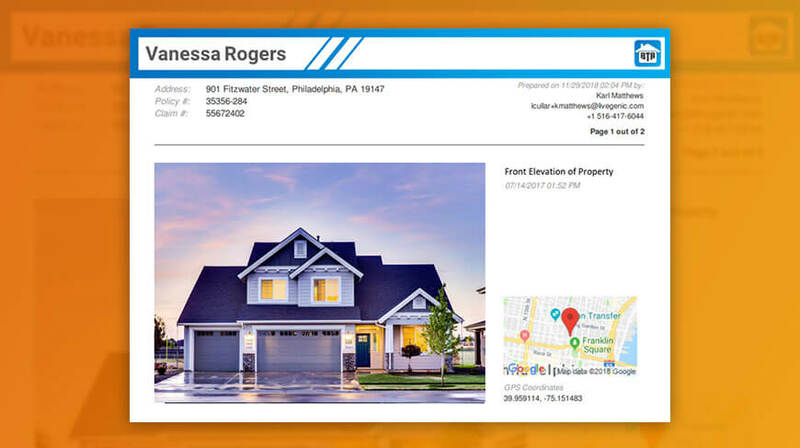 Claim Reports, the all-important overview document containing photographic images and comprehensive information reflecting the claim files, can now be quickly and easily customized by our customers. With our new system, users are able to generate beautifully branded documents, which contains all claims information, annotations and other documentary evidence which can be easily moved to support unlimited workflows, then reported, stored and reused at client convenience. Livegenic reports have always provided clients with a PDF formatted report, basic customization options, and a variety of data, such as company name, website and logo; claim-related images in a chosen order, with a description area for an agent to fill out; questionnaires; GPS data, maps and more. All these points were transferred into a PDF document, hence further changes could only take place thereafter by adding additional PDF’s. In the new Reports version, all information previously in the Livegenic system can be moved around and placed anywhere in a report, making the final product look uniquely aligned to the client brand. Moreover, reports are available on any media, enabling access and the ability to generate reports via a web browser, mobile apps, and include a fully customizable set of fields, with content added by users or retrieved by API. Flexible layouts and unlimited ways to customize and integrate into our client’s operational processes, supporting all workflows, facilitating importing/ exporting, sharing and exchanging information, forming the basis of estimation, and hard copy storage for litigation purposes. "When it comes to reporting, it is important to offer both flexibility and customization. Our new Custom Reports let us better accommodate our clients' needs and add value in this area”, said Joel Edick, Director of Customer Solutions. “It's an exciting addition to our growing list of product enhancements that our team is working on”. At Livegenic we're always interested to get feedback from our clients. Let us know how we can improve your experience with us. If you have any ideas, questions, or recommendations, please reach our Product Team at product-care@livegenic.com.